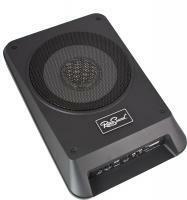 Retrosound’s new powered subwoofer is an excellent addition to your classic vehicle’s audio system. The compact footprint and powerful bass response will allow for behind the seat mounting options for pick up truck owners, under seat mounting for bench or bucket seats and numerous other in - car applications. The rigid die cast aluminum chassis and powerful Class D amplifier allow this sub to reproduce low frequencies down to 35Hz. (NOTE: SCROLL DOWN TO SEE MORE!) Here's in install video for the sub!